Taken at Victoria Park tonight before my fingers got too cold. 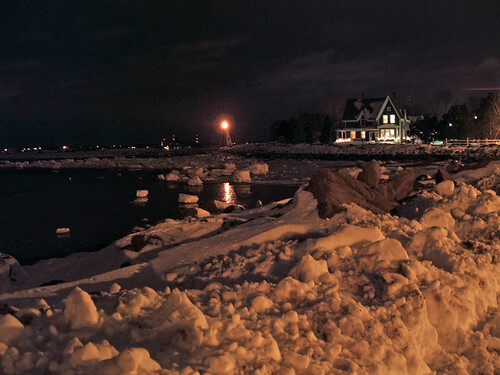 There’s a lot of neat ice flows out in the harbour. Here’s hoping they’re still there by tomorrow morning because I’d like to go get some nice sunny day shots. An amazing in depth article talking about all of the controller innovations in controllers ranging from the days of Atari to the upcoming Nintendo Revolution controller. Definitely worth reading. I know what you’re thinking, “holy crap what just happened to kuhlschrank.com?”. The site hadn’t changed at all since 2003, and as much as I enjoyed the look it was time to give it the heave ho. Not to mention the blogging software I had set it up wtih, pMachine, is now a thing of history. Sure there’s the new pMachine Free or I could pay to have the full pMachine. But let’s face it, I like WordPress better. I’ve used it for the Mac Girl and the London sites and the new version 2.0 is pretty snazzy. So here it is. Maybe I’ll make more use out of it. Or maybe not. Stay tuned to find out. If you’re ever in need of a fix for my old site you can still get to it from the link on the left, or by going to http://www.kuhlschrank.com/oldsite/. Your choice.